Here are some mini Christmas stockings I recently completed for the Warmth for Warriors. This is a new pattern where you work in the back loops only. You can find the free crochet pattern here. We are hosting a special two week Stocking Along event over at Good Things Together in support of Warmth for Warriors and this year's Mini Christmas Stocking Drive. There will be prizes, sharing and lots of fun. You don't need to be a member of the group to join in. It is all just in support of our troops and Warmth for Warriors. I'm a bit late to seeing this, but I'll do my best even if it has to be saved for next year. My son is in the Military, I'm hoping this helps motivate me. Also size in the small side is ok right? You are not too late and we would love to have you working with us. The Stocking Along Cindy mentioned in the post before yours just started yesterday. Its a Ravelry group but you dont have to be a member of that group to participate. You would just need to be a Ravelry member to access it. Warmth for Warriors wants the stockings by Nov 1st so they can get them filled and distributed for Christmas. I work on them off and on year round. The stockings should be approximately 6 inches from top of stocking to the toe. Mine are usually measure 5 inches. Just as BGS wrote, you can make stockings all year around if you'd like. A little smaller or bigger than 6 inches is fine. Feel free to post here or over at Ravelry too if you are member of Ravelry. Thank you in advance for your help with mini Christmas stocking for the troops. 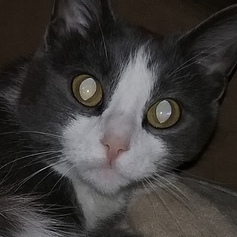 Brenda, do you think that maybe a Contest with a prize for the first place winner would be a good idea?. 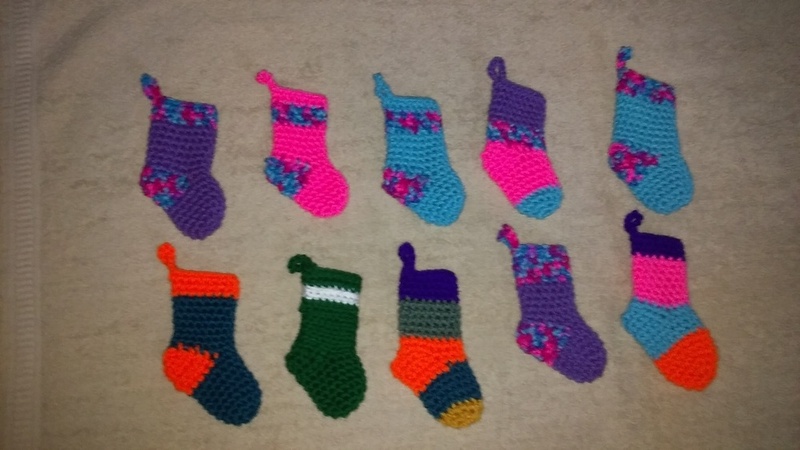 I was just thinking that maybe more people would crochet more stockings if there would be a prize to win LOL. I could "provide" that prize & ship that (US only). Nothing much, probably the value of that would be between 20 or 30 bucks. A course it probably would be a yarn (brand new & free of dust! LOL). Maybe I would ad something else..I just did not put much thought to that yet. Krys sounds like a good idea to me. Besides helping W4W it just sounds like something fun to do here. I cant see where it would hurt anything to try. Cindy what do you think? The stocking along on Ravelry is offering prizes. People making stockings are entered into a drawing. Last time the more stockings you made the more entries you had. Sometimes the prizes were a surprise package. This time you get to select a pattern from Ravelry purchase price up to $5.50. We posted photos as proof. This is up to you but I wonder if people might be even more excited to win something you make. I know I would. I have always admired your work. I absolutely love all the little holiday things you make. The little Halloween things immediately come to mind along with the heart containers. you gals here holding the whole donation between the two of you !! what beautiful stockings!! i love them all and commend your generous contributions to a worthy cause as wel, so nice job!! The group over at Ravelry Good Things Together wanted to offer prizes for the Stocking Along. The Warmth for Warriors organization hasn't offered prizes for making stockings and people have always just made stockings for the fun of it. I know I share the annual drive as an admin for the organization here at the Ville and on Ravelry. Feel free to post your stockings at Good Things Together for a chance to win prizes. I'd prefer not to get into prizes here and just ask people to support the yearly drives which also includes hats, blankets, and lapghans. But on the other hand you would not needed to be involved if you do not like to. We could have our own "drive" here with prizes. And maybe even get more new members with creative advertizing because of that..??. Just another thought LOL. After that maybe another contest with Christmas creations (anything for Christmas). And all members could vote. That would be a fun. I like the idea about anything Christmas and have a separate thread with its own contest. That way all members could participate and people could work on Christmas gifts, stockings, or whatever with a Christmas theme. Thinking out loud is good - brings up new ideas and fun possible activities. Krys I would say any crochet along contest would need a separate thread started by the person hosting/providing prize and it would be up to that person if said cal were to benefit a specific cause or not. I am very glad you have been thinking and trying to come up with ideas. Trying to get an envelope full so it can be mailed. Peggy - Lovely batch of stockings. Thank you so much for all your cute stockings! Peggy I love your beautiful pile of cute stockings. I am sure your friend will be pleased with what you did. Brenda I do know that contest would need a different thread. And for members to be able to vote individually it would need to be a special 'set-up's" to be done in this computer here by the owners of this group. For all those photo's to be shown in a "group" not individually & more.. And the way things are going here that probably could never happen. Like I said, it was just a thought (about that contest). PS: about those little Christmas stockings that was a different thing. Voting would not been needed. Just who ever would make the most. That was a bad idea too. Oh Krys how awful so sorry for the mess. I love that you are thinking and trying to come up with ideas to make things interesting around here. If we all keep thinking and sharing our thoughts we should be able to come up with something that works without needing the admins help. 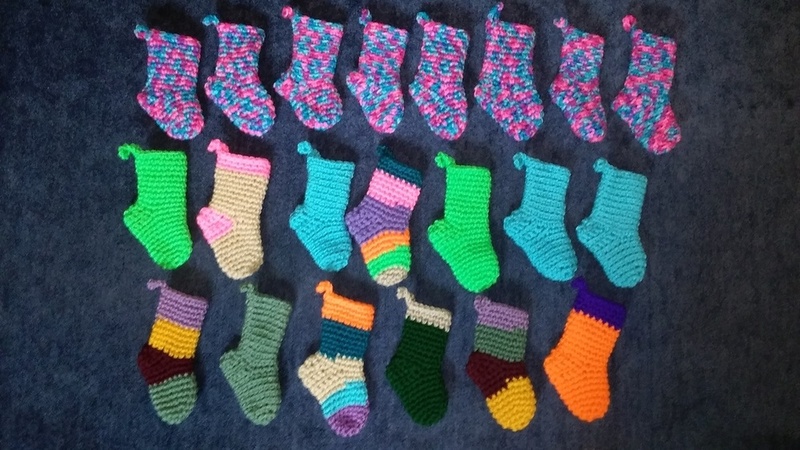 Here are the rest of my stockings for the Ravelry stocking along. Thank you Brenda for all those cute and colorful stockings for the Stocking-Along. We had a good run and it's been fun to have all the participation. Here are some of my last ones. Sorry I don't have a group photo. Sorry I don't have a group photo. All the better to see them! All just cute as can be. 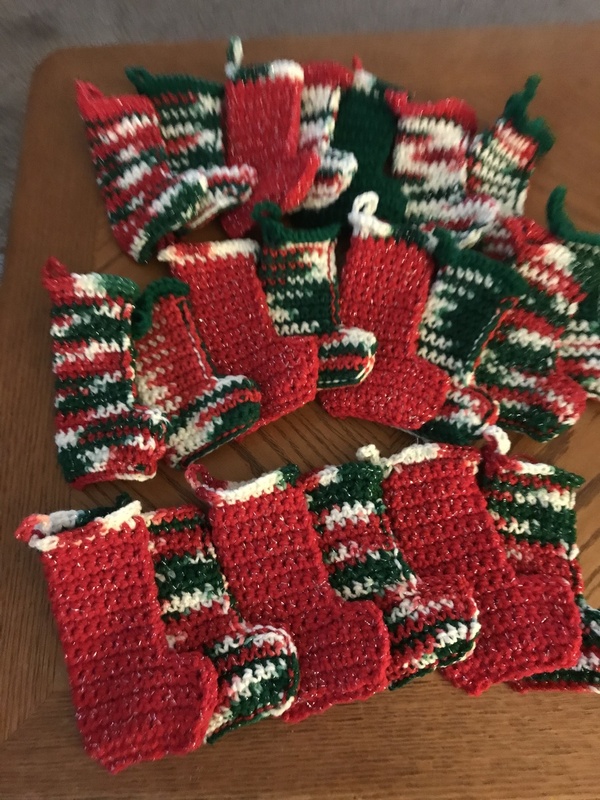 Here are some new mini Christmas stockings I crocheted for our Warrior Wednesday blitz. These are all BLO stockings and I used a skein of pretty variegated Christmas yarn that I scored at the thrift store to make these along with some red and green RH. 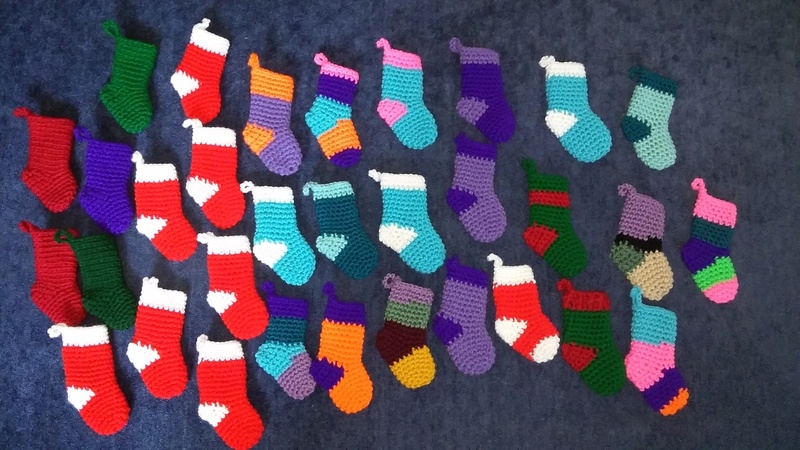 Here are the latest little stockings I crocheted for the troops. We have just about a month until the shipping deadline of November 1st.